Surface Enhanced Raman Scattering (SERS) provides strong vibrational spectra from molecules near a metal surface using scattered visible light. These are the ingredients for a powerful sensing technology, and SERS has been rabidly pursued as such over the past 20 years. In principle, SERS can also reveal the orientation of a molecule near the metal surface. The enhancement effect decays within Angstroms of the surface, so vibrations close to the metal will scattering more strongly than those far from the surface. In addition, the alignment of a vibration’s scattering tensor with the electromagnetic field will affect the scattered intensity. Therefore, in principle, one can get the molecular position and orientation from the relative peak heights from the SERS spectrum. 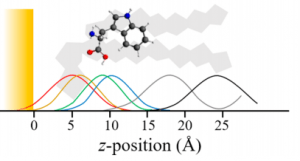 However, SERS spectra are notoriously difficult to interpret in detail since they also depend on things that are hard to know: (1) the derived polarizability tensor of the molecule of interest, (2) electronic interactions between the metal and molecule, and (3) the number of molecules adsorbed on the metal surface in the enhanced region, to name just a few. We decided to pursue this direction because it could provide molecular structural information on biomembranes under natural conditions and without labels. 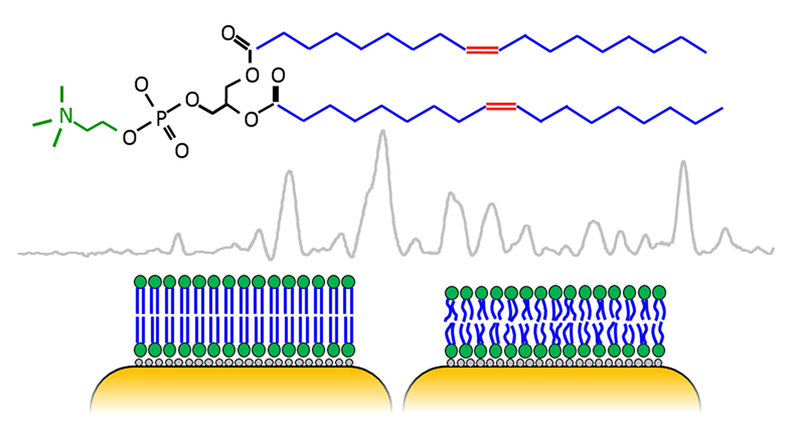 TLDR – we got it to work and show three structures in this initial paper: the CTAB layer on gold nanorods, the lipid bilayer on gold nanorods, and tryptophan in the lipid bilayer. Have you ever looked at the UV optical extinction of plasmon resonant gold nanoparticles? I mean really looked? While you wouldn’t expect any interesting plasmonic effects in the UV, some insight might be gained regarding other molecules in the nanoparticle solution. We have been told by colleagues not to bother because the spectrum is “a real mess down there”, but we took that as a challenge. Our latest paper has been published in Langmuir. 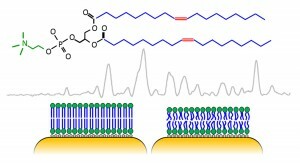 It describes the structure and state of lipid bilayers on gold nanorods. These structures have been made before, but here we have taken a very close look with LSPR sensing and SERS spectroscopy. As always, there were a few surprises! Welcome to our new lab web site. I finally decided to give up on “coding my own”, so I am using Rice’s blog service. It should be much easier to update (haha).